For other uses, see Hasty pudding (disambiguation). 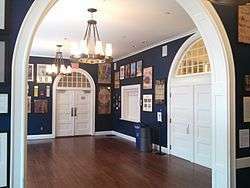 The Hasty Pudding Theatricals, known informally simply as The Pudding, is a theatrical student society at Harvard University, known for its burlesque crossdressing musicals. The Hasty Pudding Theatricals was described by John Wheelwright in 1897 as a "kindly association of men of all ages in a gay evening of simple enjoyment". Formed in 1795 as an artistic-minded fraternity, the Pudding began hosting mock trials of such phenomena as timely Harvard presidents and the study of mathematics. The Pudding put up its first full performance, of a well-known tragic burlesque entitled Bombastes Furioso, on December 13, 1844. It has performed a production every year since, except twice during World War I and twice during World War II. After a period of producing popular comedies written by established playwrights, the Pudding began to write its own shows, starting with a production of Dido and Aeneas written by Owen Wister in 1882. Previous members of Hasty Pudding have included Theodore Roosevelt, Franklin Delano Roosevelt, J.P. Morgan, Oliver Wendell Holmes, William Randolph Hearst, lyricist Alan Jay Lerner, Oscar winner Jack Lemmon, humorist Andy Borowitz, artist Henry Ives Cobb, Jr., and former Massachusetts governor William Weld. In 1948, Felisa Vanoff (1925–2014) became the first female choreographer of the company. Although the cast remains all-male (with female parts performed by actors in drag), women participate in the productions as writers, composers, orchestra, and members of the business staff and tech crew. Each spring, the Pudding's Theatricals holds a 5-week run in Cambridge, Massachusetts, and then tours to New York City and Bermuda. The Pudding is, maybe paradoxically, both a museum for antique theatrical practices and a magnet or training ground for innovative new talents. On the one hand its deliberately retro theatrical trappings (all-male cast; all-live pit orchestra with no computers or synthesizers; silly plots full of crude jokes, low-tech production values, collegiate humor and anachronistic puns) seem to preserve a museum-piece approach to musical theater. Yet for decades the Pudding has been incubating new talents at a steadily increasing rate. Pudding graduates are leaders in the fields of writing, directing, and performing in theater, television, movies and the other arts. At least three winners of the prestigious annual Ed Kleban Award for achievement in lyric writing have each been Pudding graduates. Pudding librettist Mark O'Donnell won a Tony Award in 2003 for co-authoring the book for Hairspray. He also co-authored the book for the Broadway musical Cry-Baby; its lyrics were penned by fellow Pudding alum David Javerbaum, who has since won 13 Emmy Awards, including 11 as head writer for The Daily Show—which also featured comedian Mo Rocca, a former Pudding librettist and President. Pudding Actor Jerry Colker won the Drama Desk Award for authoring the book for the Off-Broadway musical Three Guys Naked From the Waist Down. Actress Rashida Jones (seen in Parks and Recreation, The Office, Boston Public, and the film I Love You, Man) co-composed the score of the show during her senior year. Paris Barclay wrote two Pudding shows and is now an Emmy-winning director and producer for dozens of film and television projects including "NYPD Blue", "Sons Of Anarchy" and "Glee", and in 2013 was elected President of the Directors' Guild of America. Pudding actor and composer Laurence O'Keefe wrote the music and lyrics for the Off-Broadway shows Bat Boy: The Musical and "Heathers: The Musical". O'Keefe co-wrote the score to the Broadway musical Legally Blonde with his wife, Pudding librettist Nell Benjamin, who herself wrote the award-winning play "The Explorers' Club" and is currently collaborating with Tina Fey on the musical adaptation of the film Mean Girls. Pudding bookwriter Mark O'Keefe co-wrote and co-produced the movies Bruce Almighty and Click. Pudding librettist Megan Amram became famous shortly after graduating for her comic Twitter feed and now writes for television shows like "Parks And Recreation" and "Silicon Valley", and her co-writer Alexandra Petri now writes a regular column for the Washington Post, a newspaper. BJ Averell, a Pudding actor alumnus, was a Grand Prize winner of The Amazing Race and is also an accomplished sea captain. John Berman, a Pudding actor and President, is now a news anchor for CNN and has written two books about his struggles with illiteracy. The name comes from a Colonial era (originally British) dish called hasty pudding, a kind of porridge made from cornmeal with molasses, honey or other ingredients, a New World cousin to the Italian polenta; called "hasty" because it is cheap and easy to make. It is not clear whether the dish was originally a staple or a dessert, but it is now served for dessert at the banquets thrown by the Pudding, such as opening night celebrations and the annual 'roasts' for their Man/Woman of the Year (see below). The society is notable for their annual selection of famous entertainers as Woman of the Year (since 1951) and Man of the Year (since 1967). These awards are usually treated with great seriousness by the honorees, who, since the unanticipated personal appearance of Jane Fonda to accept her award, always attend the awards ceremony, and are treated to a celebratory "roast," and a parade. ↑ "An Illustrated History of the Hasty Pudding Club Theatricals". Hasty Pudding Club. Retrieved 2014-12-14. 1 2 3 "History". Hasty Pudding Theatricals. Retrieved February 6, 2010. ↑ "History". Alumni. Retrieved February 6, 2010. ↑ Dagan, Carmel (10 June 2014). "Felisa Vanoff, Dancer, Patron of the Arts, Dies at 89". Variety. Retrieved 7 July 2014. ↑ Brown, Emma S. (25 June 2014). "Obituary: Felisa Vanoff / Groundbreaking dancer and choreographer, June 11, 1924 – May 29, 2014". Pittsburgh Post-Gazette. Retrieved 7 July 2014. ↑ "Past Show Titles". Hasty Pudding Theatricals. Retrieved February 6, 2010.